I recently went to Myoko, Japan with my snowboarding brother Michael. I shared my experiences with Disabled Wintersport Australia. DWA member Kate Swain goes deep into the powder and hits the steeps on her third time to Myoko, Japan. In February 2017 I made my third trip to Myoko, Japan with my snowboarding brother, Michael. I wanted to show him my love of Myoko with its extra wide and long runs, amazing soft powdery snow, and lack of lift lines. I was looking forward to skiing with Charlie Evans, having previously skied with him in Myoko and Falls Creek. We had five days, a day off and then three more days across various resorts with varied snow conditions. We always began by bucketing the first lap. It helps to make sure everything is feeling good and to get a feel for the snow quality. We then made a plan on where to go and whether it would be best to take the outriggers and tether or ditch the outriggers and enjoy the powder. We also made plans for lunch. 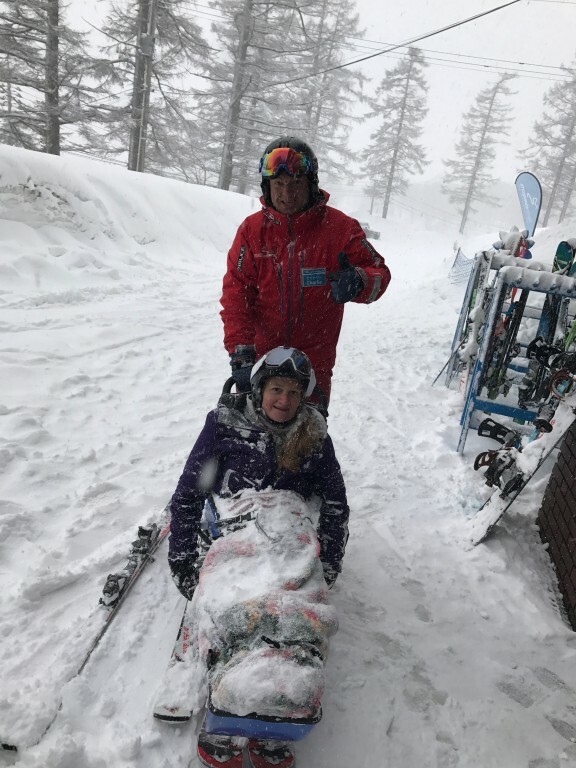 On some days this included organising another snowboarder or skier to take my wheelchair to a restaurant on the mountain ready for us at lunchtime. We made the most of an epic powder day. It was too deep to ski with outriggers so we ditched them and enjoyed going in and out of the powder. I was submarining going right under the snow! On each run I collected lots of soft snow and all gaps filled with snow. The snow continued to fall! My skiing with outriggers while on tethers improved. It was a great feeling to have my body working easily with the sit-ski and Charlie on the tethers. I wasn’t tired because I was using my whole body and the ski to do the work. I was no longer scared, not even of the bumps, other skiers and snowboarders, the speed or the steepness of the mountains. We decided to ski with outriggers, with Charlie on tethers, on my first black run. Following Charlie’s instructions, I was able to make each turn. On one turn Charlie slowed me down a bit too much that I lost momentum and was instructed to fall. It was my first fall but it didn’t hurt as I was leaning so far over that I just relaxed my arm until Charlie picked me up again. We tried it again and again, with the tethers as long as they could go. I loved the steepness of the mountain and the speed. It was an amazing accomplishment! At the end of each day I was covered in snow looking like a snowman! I loved it! Sit-ski as submarine was originally posted on the 21th February 2017 on the Disabled Wintersport Australia blog.